If you have to eat a worm, this is the way to do it! think I'll go eat a worm." It popped into my head for some odd reason and I couldn't get it out. So . . . I turned it into edible cocktails. Cute, green little jello shots that will tickle your happy hour fancy. And you can make them without alcohol for kids parties. They are fun, delicious little tropical flavored bites infused with your favorite fruit flavored vodka, simple jello shots (the "primordial booze") with a sour gummy worm crawling out. Spray all your molds with cooking spray and set aside. Add the 1/2 cup of pineapple juice and 1/2 cup of Sunny Delight to a saucepan. Sprinkle in the 2 packages of gelatin powder, give a quick stir and allow to sit for a couple of minutes. Warm this mixture over a low heat for about 5 minutes, long enough for the gelatin to completely dissolve. Remove your pan from the heat and stir in the lime gelatin mix until dissolved. Add the 1 cup of Gummy Vodka and stir. 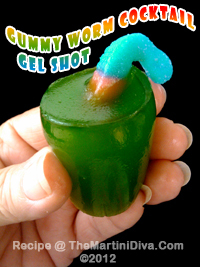 Pour the mixture into your plastic jello shot cups, add one gummy worm candy and refrigerate until set, a minimum of two hours. You can soak some of those gummy worms in the same vodka overnight for an extra boozy kick. Just put some in a glass container then cover with vodka. Strain them out onto parchment paper then let them dry a bit and roll them in sugar. If you're preparing these for a party that will have children present create some without alcohol simply by replacing the liquor with the same amount of a non-alcoholic liquid or puree of a complimentary flavor, BUT be sure to make the non-alcoholic ones look very different from the ones with alcohol. National Gummy Worm Day is July 15th.